Hello! 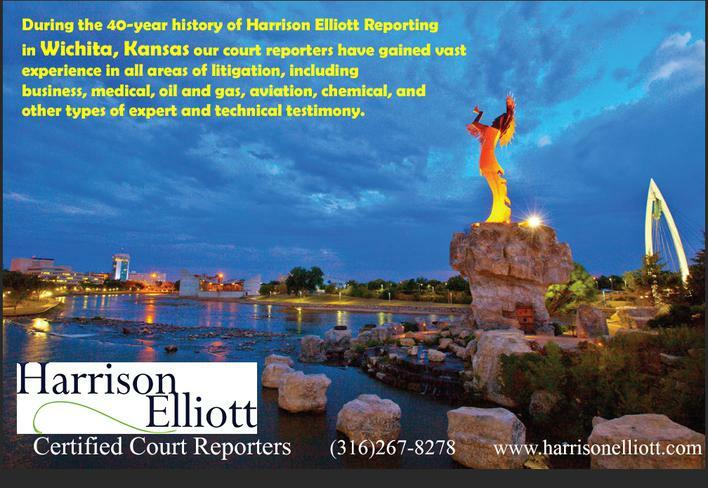 Welcome to Harrison Elliott Reporting Wichita court reporting, serving Wichita, the state of Kansas, and beyond since 1972. We have performed assignments in all major cities in the United States, as well as in many places throughout the world, including England, Belgium, Spain, Brazil, Bermuda, Mexico, and Curacao. Our staff of experienced certified court reporters is ready to handle all of your reporting needs. Our highly efficient document production department is able to provide you with the fast and accurate service you expect and deserve. We will get your exhibits back to you quickly in any format you choose, whether hard copy, CD, or email. In addition to having the finest, most experienced reporters in the city of Wichita, we also offer our own in-house videographer, who is prepared to digitally record your deposition. He is also equipped to digitally synchronize your transcript to your video. If the assignment requires video conferencing, no problem—we can provide that service as well. Copyright 2010 Barber Court Reporters: Court Reporters. All Rights Reserved.